Roseland Terrace is bounded by Government, 18th, Myrtle, and 22nd Streets. Placed on the National Register in 1982, it dates from between 1911 and 1930. Baton Rouge's first subdivision, Roseland Terrace, was "staked out" in 1911 by the Zadok Realty Company, which had bought the land in 1910 for the sum of $50,000. Prior to this time, the area had been a racetrack and had a decidedly rural character. The fence surrounding the track was covered with wild Cherokee roses. Stories are told that people warned Zadok Realty that the lots would never sell because they were too far out in the country. A citywide contest was held to name the development, and the winning entry was Roseland Terrace, in honor of the Cherokee roses in the area. To continue this theme, the streets were given flower names. Zadok Realty Company's promotional campaign was obviously successful because after two years they had sold 408 lots at prices ranging from $150 to $500. As can be seen in the extant houses in the district, Roseland Terrace hit its peak of popularity in the late teens and the 1920s. By around 1930 development was virtually complete. The earliest houses reflect the Queen Anne Colonial Revival influence of the late nineteenth century. These houses have features such as small fluted columns, curved galleries, semioctagonal bays, and relatively elaborate rooflines. Building in Roseland Terrace underwent a boom between about 1917 and 1930. During this period large numbers of bungalows were constructed. The basic bungalow is a raised, pitched roof, frame structure, 2 rooms wide and 3 rooms deep. The plan is hall less and has wide openings between the public rooms. In all but a few cases there is some sort of front porch. Some have half porches and some have full porches. The Roseland Terrace Historic District is significant in the area of architecture as an example of an early twentieth century residential neighborhood. It retains 88% of its pre-1930 housing stock. 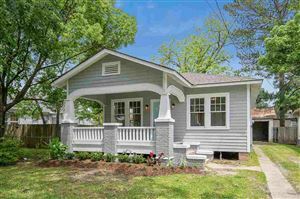 Moreover, with close to 300 well developed bungalows in a concentrated area, Roseland Terrace is one of the best preserved early-twentieth century neighborhoods in Louisiana.The overwhelming majority of the structures in the district exemplify the classic bungalow style. These houses are characterized by broad openness, elaborate transfer of weight, massing that hugs the ground, and the bold expression of structural members. Because of this, Roseland Terrace is an excellent representation of the bungalow period, which is an important chapter in the history of American domestic architecture.